To enable sharing and community curation of of these disease knowledge representations, using the NDex or other appropriate frameworks. We anticipate that these research efforts will facilitate i) interpretation of new experimental data (such as differentially expressed genes) in the context of existing background knowledge such as pathways and protein interactions, ii) hypothesis generation by enabling mining of the complex networks to look for new unexpected relationships and iii) exploration of disease co-morbidity in terms of molecular mechanism. 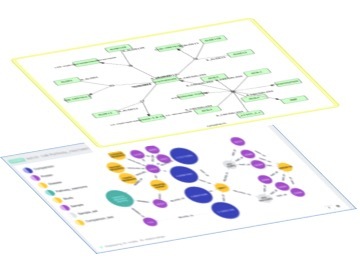 The Disease Networks module is been developed as a multi-scale framework (using the graph datagabse approach) to facilitate management (integration, exploration, visualisation, interpretation) of diverse types of biological and biomedical data. Disease Networks employ the popular graph database Neo4j, which provides a persistence mechanism that is robust and has powerful functionality (the Cypher query language) that allows the user to query networks, to find connections between particular data entries using graph traversal techniques. Disease map is a collection of interconnected signalling, metabolic and gene regulatory pathways relevant to a particular disease. Disease mechanisms are depicted on the level of molecular processes and represented in standard computer-readable formats. Need more details on Disease Maps? We would be happy to hear from your experience and for feedback, any issues/ suggestions on this, please contact us by email to Mansoor Saqi at msaqi@eisbm.org, Irina Balaur at ibalaur@eisbm.org or Alexander Mazein at amazein@eisbm.org. Authors would like to acknowledge for access to the Neo4j and to NDEx frameworks and for data resources within the databases interrogated: DisGeNET, DrugBank, Human Protein Atlas, IntAct, Reactome, UniProt, Human Metabolic Reconstruction (Recon2). Users of this resource should respect any restrictions of use associated with these component databases.